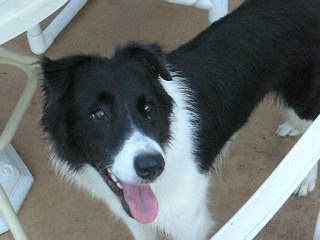 On May 14, 2009 I received an email from Mary Lou asking me to take her 1 year old female Border Collie, Marley. This female was originally purchased by a couple in Kissimmee, and then surrendered to the Osceola pound. At that time the dog’s name was MiMi. Mary Lou’s family adopted the female and named her Marley. The dog had too much energy for them, constantly barked, and bit Mary Lou’s granddaughter while in the baby pool (holding the water hose). Mary Lou tried to re-home Marley to a young family nearby. After one week, the new family called Mary Lou and said they too could not keep her. It was at that time that Mary Lou called the Osceola pound, and they gave her my phone number. After a few phone calls, and without a physical photo of the dog, I agreed to take her. Since my Reckless had passed away in February, I had room in my family for another Border Collie, and felt we would keep this female for our own. Rex picked up the female, and after a few short hours, my son, Ryan renamed her Bonnie. I began to call her Bonnie Belle. I later found out that Bonnie had spent 95% of her life either tied to a tree or in a crate. It seems that when a family has a dog that has too much energy, they crate it or confine it in some way. The more they crate it, the more energetic it will be when they release it. The more energetic and hyper it is, the more they crate the dog. It’s a horrible cycle that doesn’t do anyone any good, especially the dog. Bonnie was very energetic, she barked constantly. She barked so much my friends didn’t want to come over any more!!! But over a period of a month, I was able to work with her in certain areas. On May 17th, less than 1 week later, Ozzie, a 2 year-old male was owner-surrendered to me as well. We realized immediately that Ozzie was very much like our Reckless, and my family decided that we would have to find the proper home for Bonnie, and we would keep Ozzie. However, we would have to work with Bonnie Belle until she was fully-adoptable. We did not want Bonnie to be bouncing from house to house ever again. As much as we really liked Bonnie, we were not the right family for her, and we were smart enough to admit it! Bonnie was not interested in attention whatsoever. All she wanted to do is play and run. It was hard to motivate her, but slowly, I let her out of her crate, and let her sit on the couch with me, and would pet her. She would play-bite a lot, and I turned that into a game. Eventually Bonnie was allowing me to take bones and toys right out of her mouth, and was becoming a well-balanced dog. Bonnie did pull down an entire pizza off the kitchen counter and it all – it was a Large! She ran so much that she created a deep ditch in my backyard, and killed the grass where she wore a deep path. Bonnie was placed on Pet Rescue by Judy’s website for adoption on May 28th, 2009. I noticed that Bonnie was constantly chasing birds and planes in the sky. I contacted 2 Border Collie Bird Strike Programs. After listening to my description, and watching Bonnie’s youtube videos, both programs were interested in her. However, I seriously considered the BC Bird Strike Program in Willis, Texas. It was then that we learned we would have to wait at least 3 weeks before Bonnie could be transported via Southwest Airlines to Texas. At that time, we took Bonnie Belle off the website and put her in “pending” status, which means potential adoptors would not “see” Bonnie as available any longer. I know that Bonnie would do well as a bird strike dog, and as bad as I wanted her to have a full-time job, it bothered me to have to put her on a plane. While waiting for her trip to Texas to be coordinated, On July 8, 2009, I received Mel, a 4 1/2 year old male rescue from Georgia. Amazing as it sounds, I received an adoption application for Mel. Unfortunately, the application came in too late, for I was actually doing Mel’s adoption at the time, but the application was perfect for Bonnie Belle. On that day, July 13th, I contacted Trish Morgan and asked her if I could interest her in another Border Collie. When I mentioned Bonnie Belle to her, she screamed. It appeared that one month ago, she saw Bonnie on the website while they were living in Louisiana, and preparing to move to Florida. They had their heart set on Bonnie then. However, when they moved to Florida, they noticed that Bonnie was no longer on PRBJ’s website. Heartbroken, they decided to put an application in on Mel instead. I felt that THIS was her forever home, and there was a reason why Bonnie’s flight to Texas was delayed. I suppose I felt that she wasn’t supposed to go to Texas… she was supposed to be adopted by Trish, her wonderful husband, and her two lovely daughters. Trish lives on a 7 acre horse farm, and had promised her daughters when they moved to Florida, she would let them have a dog! I met Trish at my home on July 16th for an initial meeting. On July 19th, I drove Bonnie to their home and the adoption took place. Bonnie’s flight to Texas was scheduled for July 25th, and it was cancelled! I believe that giving up Bonnie Belle was probably one of the hardest things I have ever done. I was very much in love with that dog! Bonnie continues to be a huge source of love and entertainment for our family. After installing some new fencing, we finally have a large area for Bonnie to run free. She LOVES it. There is a small pond that feeds onto the property, so after making sure all 3 of the horses are where they belong, Bonnie jumps in her little stream to cool off and then rests in the shade. She is very proud of herself and a job well done, since 3 is soooo many horses to keep track of. She is also becoming much more receptive with strangers and people she hasn't met. She's put on a little weight since she's arrived and loves to sleep under the desk when mom is working at the computer. We just love her!! I am so sorry to hear this very sad news. Goldie was so lucky to have you there for her, even if it was for a brief period of time. Please don't be discouraged. What you do is fantastic. If it were not for you, we would never have found our beloved Bonnie Belle, who we love very much. She continues to improve every day, even warming up to strangers in our house, (which she didn't do when we first got her), and enjoying life out here on 6 acres. She is a constant joy to my entire family (the girls still haven't tired of walking and feeding and brushing, etc… her). If it hadn't been for your hard work, we would never have found Bonnie. Take some time to mourn for Goldie, but don't forget how much your efforts are appreicated by people like me. I stink at computer stuff, so I don't blog or email much, but just know your successes are far greater than your setbacks.